I will definitely show up to any party where huevos rancheros are on the menu. Make them into individual egg cups, and I’m there all day. What is it about Tex-Mex food that screams party!? I mean, it’s snacky but also hits all your cravings: salty, cheesy, and savory. 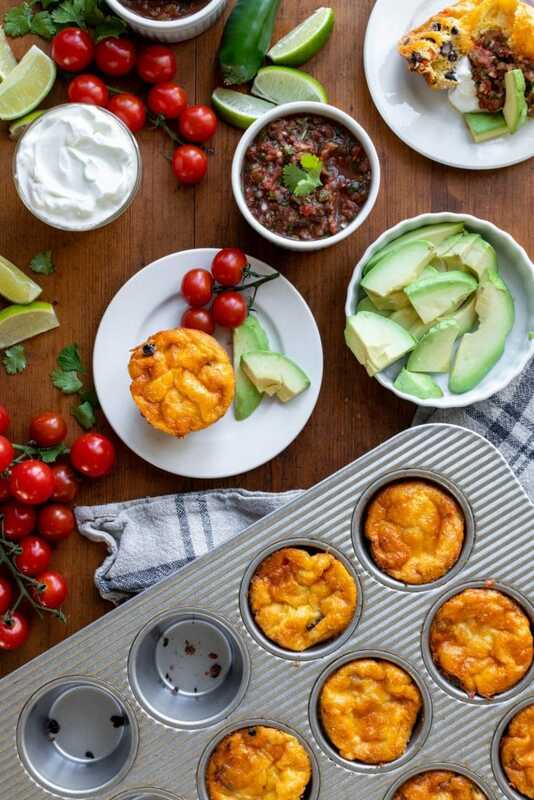 Plus, so many Tex-Mex foods can be topped with avocado, salsa, and lime, and those are essentials when I’m being honest about what my taste buds crave. Not every party calls for these flavors, but the ones that do always seem so much more fun! I’m gonna guess that it comes at no surprise that I don’t go to Super Bowl parties to watch the game. I can’t even tell you what teams are going to play, but I, of course, do know who is going to perform at the halftime show. I do go for the food. I love the dips, especially that easy queso-like one full of processed cheese, taco seasoned beef, and salsa. You know the one… and don’t act like you don’t love it too! What’s most fun are those foods that surprise you: the ones you don’t expect to see on a traditional party spread. Even though it’s a football game, it can still be fun to change up the normal buffalo wings for something different. 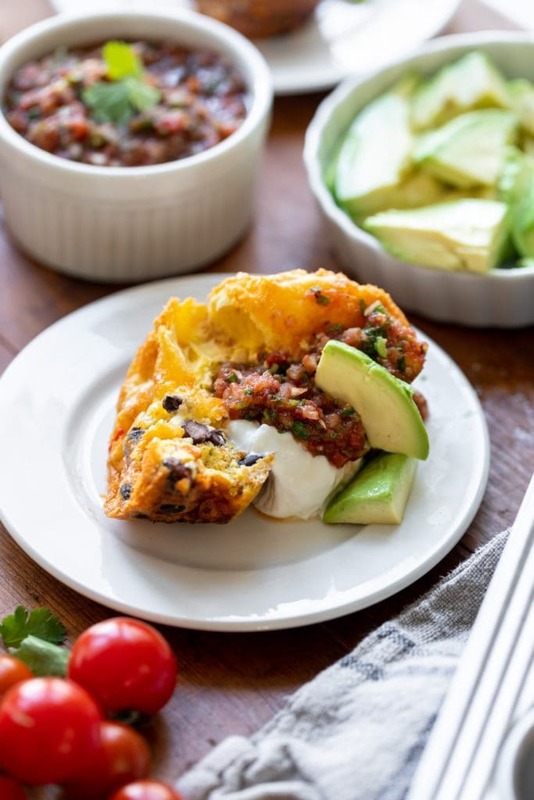 That’s why this year I’m opting for these huevos rancheros egg cups. Just give me some sour cream, homemade salsa, and guacamole, and I’m all good to go! When developing this recipe, I started with chorizo as my main inspiration. This meat is packed full of a chili and cumin punch that works its way throughout the entire dish. And what I love about chorizo is that it’s spicy, but not in a heat-spicy way, just a flavor-filled spicy. Frying the chorizo as the first step releases the flavors and oils within the meat, which provides the perfect base in which to sauté the onions and red peppers. I’m not a huge fresh pepper fan, but I definitely like the bite they add in these cups. Black beans add texture and more protein, but it’s the Super Bowl, so who’s really keeping track? 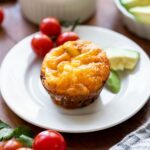 A dose of grated Monterey Jack cheese adds a subtle flavor to each bite. And it melts amazingly, which is a bonus. 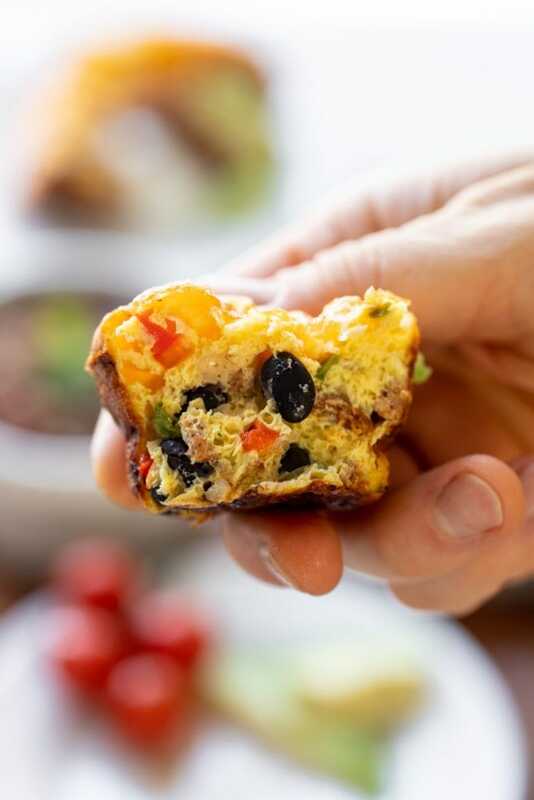 Once the meat, peppers, and beans are portioned in the muffin tins, the egg mixture is poured all over the top. I love using this methodology because it ensures that the eggs reach every nook and cranny. To gild the lily, I prefer to top each egg cup with a little bit more Monterey Jack cheese, just for good measure. With that, they’re ready to bake! Not only are these wonderful while still hot from the oven, but they’re great at room temperature as well! I know, you’re totally thinking how perfect that is for a party. 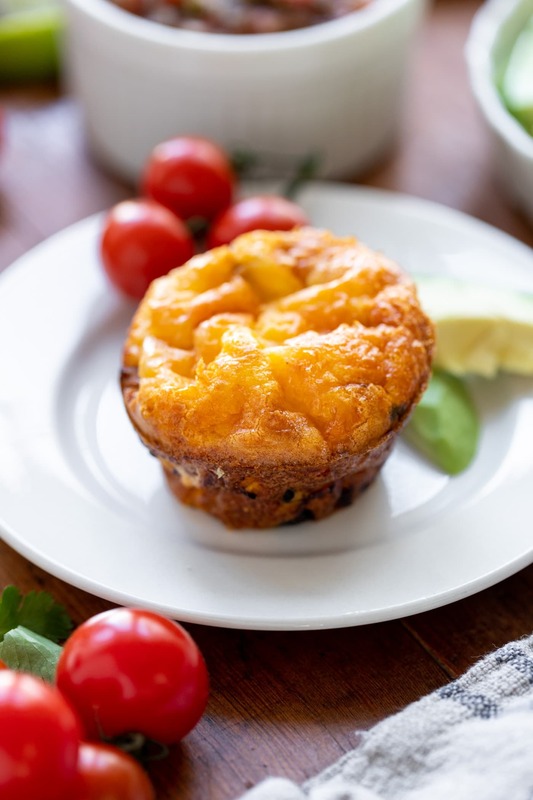 Arrive with warm egg cups and have no fear that their flavor will decrease as they settle to room temperature. For those that like the idea of a little healthier option, these are the go-to. For everyone else, they’ll just taste amazing and be gone instantly. 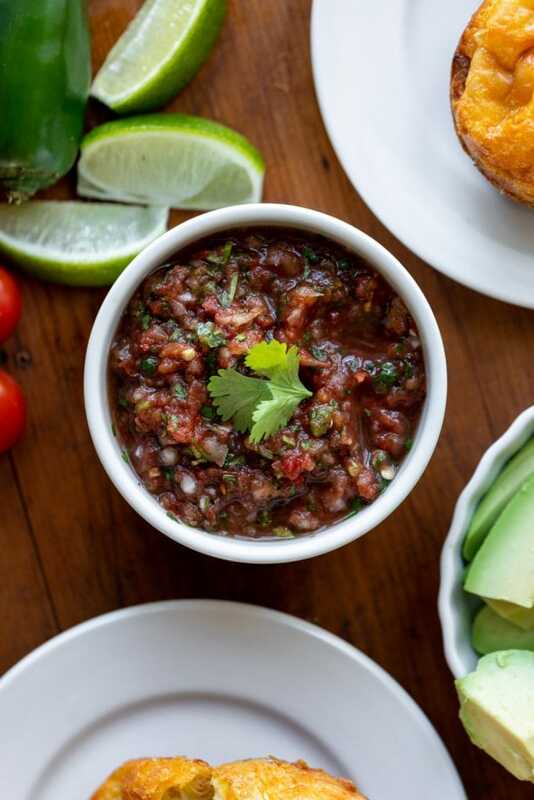 To make your friends even more impressed, you can make the 5-minute restaurant style salsa and send them over the edge. Did I mention you’ll never want to buy salsa again? It’s the year of #LetsGetBrunching! 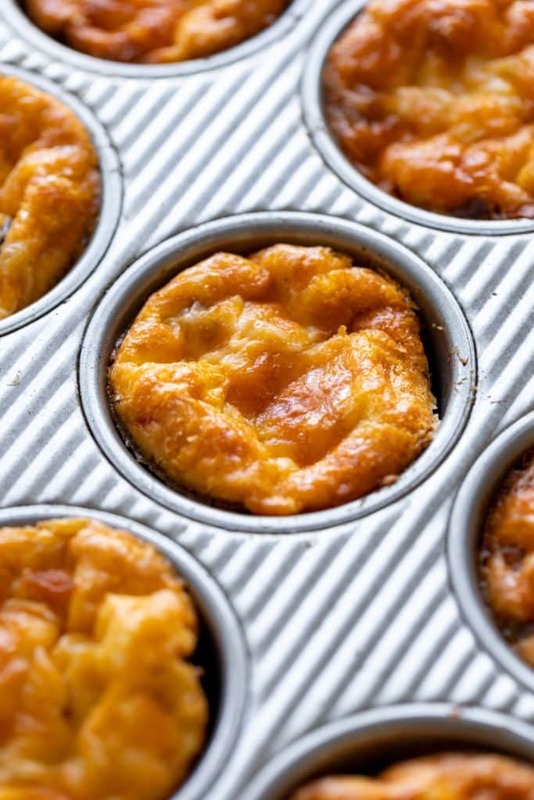 One of my all-time favorite breakfast quiche recipes. That flaky crust though! I love throwing something together to let mellow overnight. Enter this blueberry French toast bake! A hearty bread anyone? Oh, and there’s five ways to toast it up too!